I was just ordering Toby's fabric nappies from Bambooty (the boy likes his food - he's outgrown the small size already!!) and it reminded me of this program I've seen on Facebook. 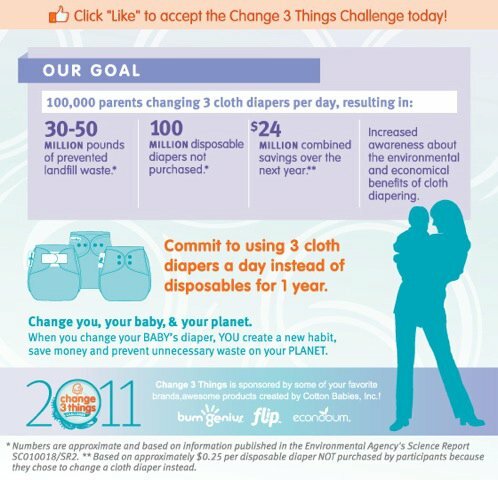 The Change 3 Things challenge has a similar philosophy to The Lavender Experiment, in that if we all changed the things we could (in this case, swapping three disposable nappies a day for three fabric nappies), the change we'd see in the world would be far greater than the small effort it takes. Like I've said before: baby steps. Nappies, cleaning products, growing herbs, repurposing furniture, recycling - whatever your baby step is today, or this week, or this month - just know it all makes a difference.